by Betsy: ZI(P)A or PIZA? ZIA, stands for Zentangle® Inspired Art. I'm thinking this might be a new category, Zentangle Inspired Practical Art. But then after rearranging the letters, I'm thinking Practical Idea Zentangle Art or PIZA has a tastier ring to it! What do you think? My calendar was inspired by a pin using W2. (I believe you need to have Pinterest to see the link). My calendar is in my bullet journal. I use it as a journal, calendar, notebook and also practice new tangles or sketch out card ideas. The great thing about a bullet journal is that you use it how it best suits your needs and you can continually change it to do so. If you're interested in bullet journaling, check this out. 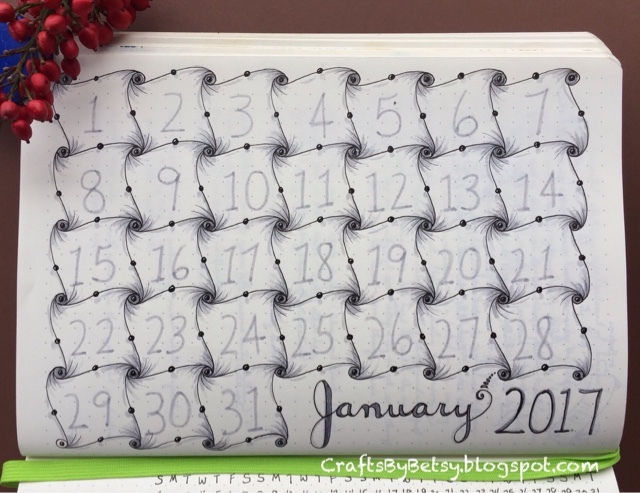 I used Cadent for my calendar, but you could give a try to any grid based tangle. For more Cadent inspiration, check out Margaret Bremner's Cadent, and then some post which inspired my previous post. Awesome idea! Happy New Year! That is so cool, very Escher. What a wonderful idea! Your January page is just beautiful! Wishing you a happy and peaceful year, too!